Now if scientists could just genetically engineer a pet that could play videogames with me, i’d be a very happy person, indeed. HAHAHAHAHA! I’m still laughing after reading this. Between Cornfather’s scratches, and the last panel with all of the comedy gold going on it, I’d have to say I’m loving the (BAD! )weasel *ahem* ferret storyline! And I don’t think that a newspaper will do much for a ferret, on a dog maybe.. but not a ferret. Cornfather better check himself, before Abraxas does the same to him as he did the game controller! Another great one! :-D! Hahaha! I’d hit that foul smelling lump of fur and claws with a newspaper too. Poor little Abraxas! He can eat my game controller… Good one JEFBOT!!! NO! that would only serve to reinforce that naughty behavior, JP! AH, the Cornfather displays wisdom gained through harsh experience. ‘Bot would do well to listen to his friend on this subject, but will he? WILL HE? On another note, I was just over at Dave Kellett’s Sheldon before I came here today and noticed your ad on his site; the big one that cycles through different images from the strips noting that All Sith Lord Roommates and Multiethnic Actor Geeks are in fact Normal and I just wanted to compliment you no it. Clever playing about with the tagline, actual strip numbers to go along with the images… as a graphic design nerd, I dug it. Were I not already a regular Jefbot reader who would have been over here today anyway this ad would certainly have aroused my curiosity to point where I’d have had to come and check out just what was going on over here. Yep…. that’s exactly what they do! Bad little critter! I love how The Cornfather doesn’t move or change one bit from frame one to frame three… Awesome job Jefbot! on a side note, you’ll be pleased to know that with dr. bombay’s return to the rescue group, he is back to “gandalf”. hahahaha! Hilarious! I missed the previous strip so I was like what the hell is wrong with the Cornfathers face. Now I get it. yup! sometimes exposition is just really clunky, so i’m relieved to hear people like yourself will turn back a page or two to find out what’s going on. Nice mute textures on today’s strip, bot. That’s a strong ferret, or a controller made of paper. All seams to be going nefariously well with Xinda’s plot to cause discomfort and anguish to our heroes peaceful apartment. 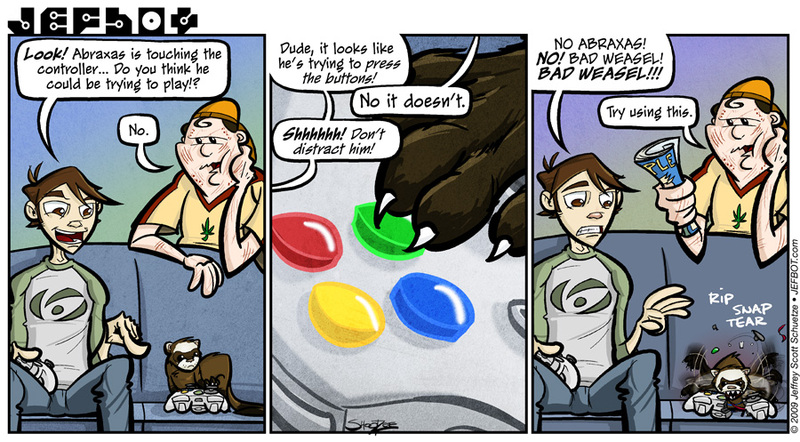 although not a good pet, i do know a fuzzy creature that digs a good co-op gaming experience. …and it’s breaking jefbot’s heart, reynard61!!! you know, they do genetically engineer women to play video games. if you’re super lucky, you even get a controller-wielding love lady who does everything a ferret does. I noticed scratches on Cornfathers arm in the 3rd panel that werent there in the first. Look at right above his elbow in those 2 panels and ull see some scratches in the 3rd that werent there before. good eye, Sgt Kazcmyzs! i was always a fan of those “can you spot the difference?” puzzles (in Highlights magazine, i think?) when i was a kid and have no qualms about making subtle differences between panels. smack the bloody ferret. one thing i also hate is creature that destroys my console. jeffbot in panel 3 doesnt look too convincing. something doesnt seem right about his expression and dialogue. well it could only be just me. my cat once scratched three deep grooves in the top of my original xbox console, JF3, but i got over my anger once i realized it looked pretty cool. and i’m sorry you weren’t feeling that 3rd panel. i was going for a more “teeth clenched” response in this one, since i had him “open mouthed” and shouting in the last one. no shame in being a Sony person, DJ! i love my PSone, PS2, PSP and PS3! and now that they ditched the SIXAXIS for the Dualshock 3, i’m loving playing my PS2 and PS3 games with a decent wireless controller. Might not need the Pokedex after the battles by the looks of Abraxas and his desire to destroy. I’m still hoping for a confrontation with the toilet spider! Can I start placing bets now? $20 on the spider to lose and $20 on the Cornfather to make it out the rest of this arc unscathed. someday the critter behind the toilet will reveal itself, Foxmouse! just not yet. The Cornfather looks good in red. I have been wishing for a cat that could play video games, too. Of course, if she’s anything like me, she’ll cheat. The ferret’s a little psychotic. animals are overrated. what you need is Zeke.